To make a long story short, Reddit recently had its April Fools joke. As per usual it was a social experiment, this time allowing it's users to draw anything on a 1000x1000 canvas for 72 hours (the time limit was only made known after it had already passed). And, conveniently, Arqade was able to get in on the final canvas! We're inside the Swedish flag next to a Spiny and underneath the Nintendo Switch banner. Oh snap, I missed this post! Firstly, big shout-out to the members of our great community who helped build the logo, one pixel at a time. Honestly, I'm not sure what to talk about so I'll just talk about the story. The thing that started it all was this chat message. Everything kinda just went naturally after that. We picked a location (right next to /r/straya, actually right here) and started building. Now, funny enough, see that Timbers logo below? I actually assisted them to move it a few pixels down so that we wouldn't fight each other, but they ended up surviving much longer than us. Oh well. I also asked on three relevant communities if they could not damage us, but they didn't really care (or rather, the people doing the expansion weren't active in those subreddits). Here are the posts for the interested folk: /r/parahumans, /r/straya and /r/australia. While deciding if we should build it again, I got into the politics of /r/place and somehow ended up as a diplomat and mod on /r/transflagplace's discord and as an Admin on /r/place world congress. How? I don't know. As someone with tons of social anxiety, even I'm surprised that I could speak well enough to represent a big and active community. 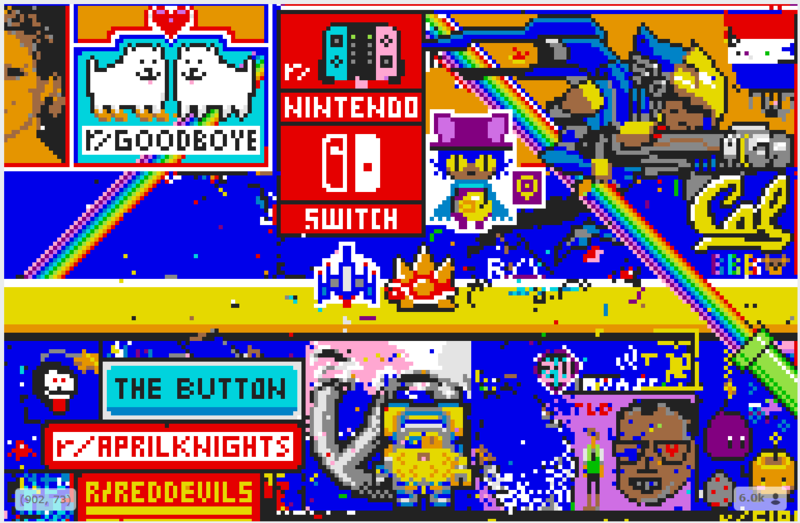 So then, we ended up deciding to build it again at, to a position on the east of Nintendo Switch logo. It ended survived a long time there, right? Yeah. Nothing much to say about that except that it was a quick defeat. After finding a new spot, we went on to build under Nintendo Switch, hoping that it'd be a secure position. We kinda got into a fight with Sweden's flag, but some passive aggressive request to spare us turned out to prove the power of diplomacy. I feel like praising myself, so I'll go ahead and say that I think that my political status helped that a bit too. Back on topic, it was mostly painless after that, and we ended up playing the waiting game to see which would come first: someone attacking us, or /r/place's inevitable ending... and it turned out that the end wasn't that far away, so we survived in that location, and now we have our spot in Internet and reddit history (and on my laptop, I guess). I still kinda regret not adding the gray-black Arqade name under it (can be seen on first gif), but it's glorious nevertheless. So yeah, you now know how the Arqade logo in /r/place came to existence and fought for having a position in the canvas. You can view it in all its glory right here. Considering recommendation requests are arguably out of place on Gaming, where should I ask them? Interested in a short story contest taking place in games' story lines? Is Arqade a place for guides and walkthroughs? Why is the minimum reputation to place a bounty so high? Would this type of question have a place?